When you think of octopuses, what comes to mind? Escape artists, masters of camouflage, and expert jar openers are some of their many skills. 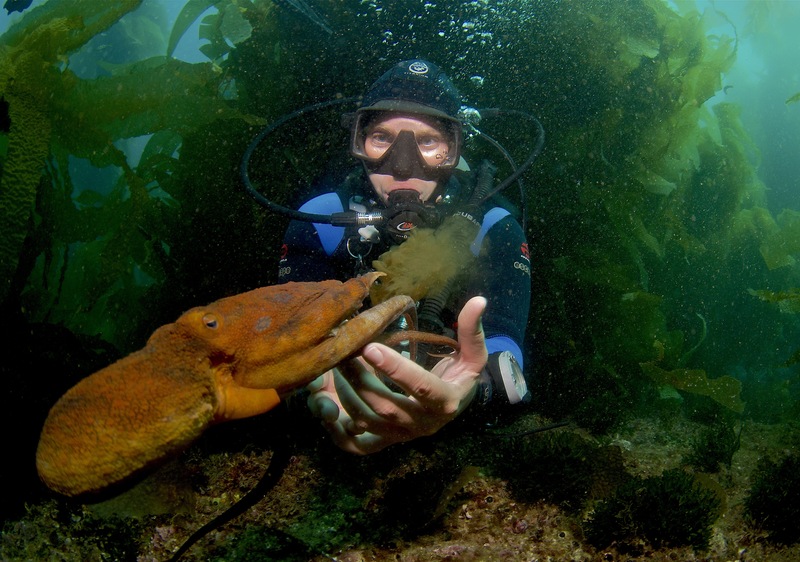 But not many people know that they also play very important role in the kelp forest ecosystem. As both a significant predator and prey item, they have the potential to be influenced by even small changes in the environment. However, because of their aforementioned skills, there is still a lot we don’t know about them. I am a PhD student at UC Berkeley, and a third-year USC Wrigley Institute Graduate Fellow. Since 2011, I have spent my summers on Catalina Island, SCUBA diving and trying to figure out the mysteries of the octopus. There are four species of shallow benthic octopuses on Catalina Island. The red octopus, Octopus rubescens, is usually what you will find in tide pools. One of the smallest octopus species in the world, Octopus micropyrsus, only reaches about an inch in length and lives in the holdfasts of kelp. 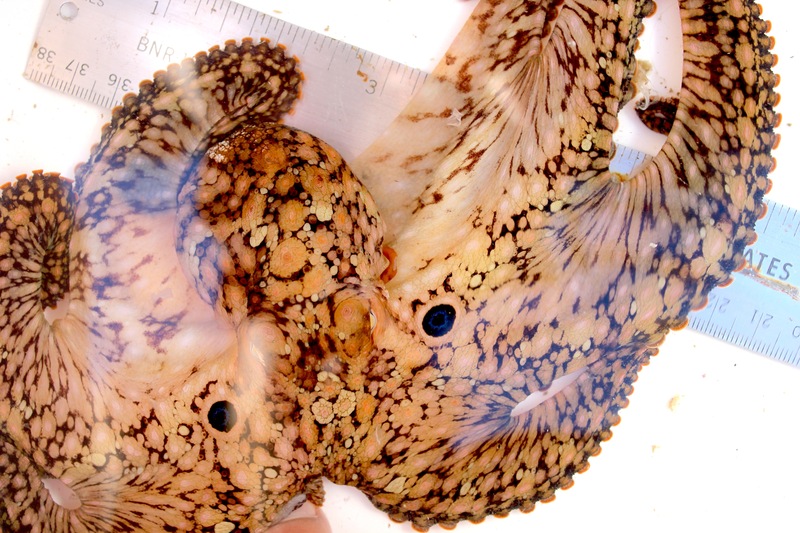 The two species of octopus I study, Octopus bimaculatus and Octopus bimaculoides, look virtually the same and go by the same common name: the California two spot octopus. They are identified by two bright blue spots on either side of their head, and differ only in the size of their eggs. For my dissertation research, I am trying to answer some of the unknown questions about octopus behavior and ecology using the California two spot octopus as my study organism. What controls their populations? How do Marine Protected Areas affect them? How much do they move? On a typical day, my dive buddy and I go on 2 or 3 SCUBA dives and measure octopus populations. 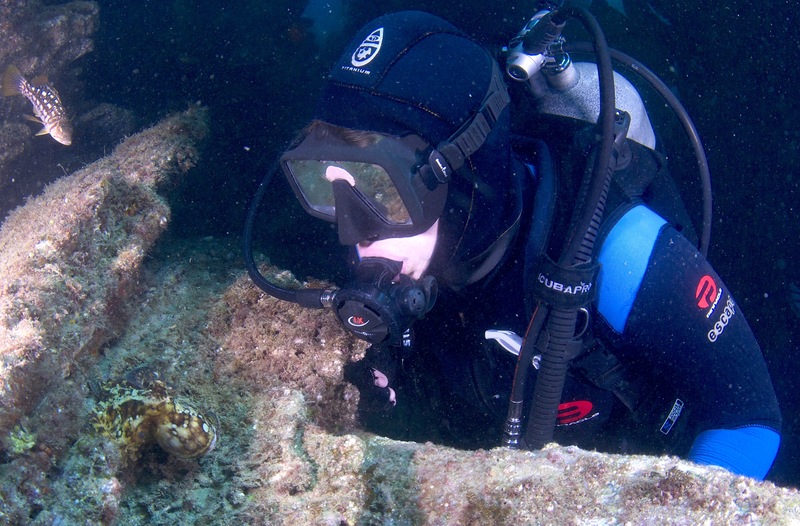 At 24 sites throughout the Two Harbors cove at Catalina, we look for and count every octopus we can find. 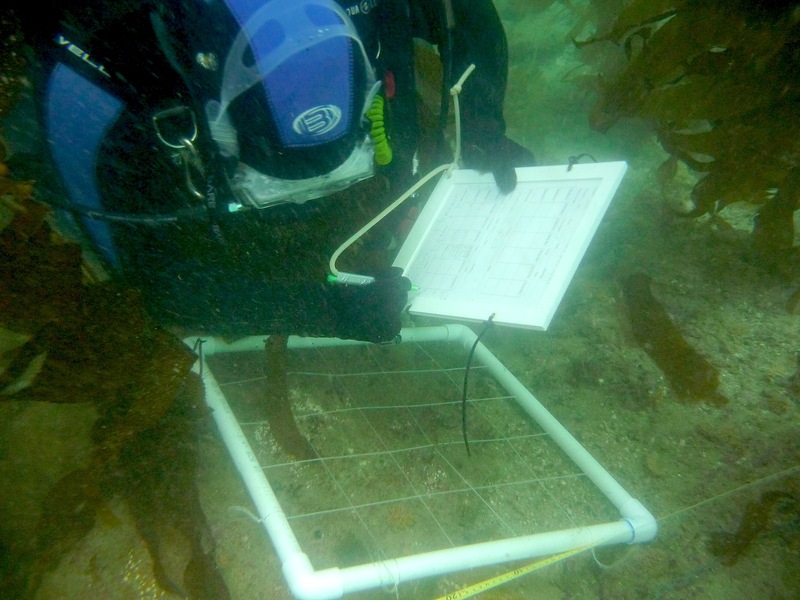 We also keep track of the numbers of their predators (like moray eels, kelp bass, and sheephead) and prey (like snails, crabs, and clams), as well as measure components of the habitat like 3D complexity and algae cover. Once I have all of these data, I use a mathematical model to assess how everything is related. This work will help me understand the behaviors and foraging impacts of these octopus on Catalina’s rocky reef kelp forest ecosystems, and how octopuses may respond to changes in their environment. This August, I am starting a new and exciting project where I tag octopuses with acoustic tags to track their movements. Look for a future blog from me for more updates! Jenny is a graduate student at the University of California, Berkeley, in the Integrative Biology Program; and a 3 year veteran of the WIES Summer Graduate Fellowship! This entry was posted in Graduate, Wrigley Institute on July 31, 2014 by Jessica Dutton.